Times change at lightning speed in the business world, but some small traditional operations are still hanging on despite daunting economic challenges. A labour shortage, evolving consumer trends and pricier rents are making life increasingly hard for such outfits. Take Mr Alan Wong, who worries about the future of his antique and vintage goods trading and restoration shop, Yasashii Trading, should any of his workers retire. "We face a lack of manpower because many Singaporeans do not have the skills needed to do restoration work," he said. The shop in Bukit Merah has three employees, all in their 60s and 70s. "Without them, I might have to stop the restoration part of my business and focus solely on trading antiques in the long term," added Mr Wong, 49. He said his staff cannot be easily substituted by machinery as antiques are distinct and refurbishment cannot be standardised. He suggested that quotas regarding foreign workers be more flexible to allow certain industries to hire more people with specialised skills Singaporeans lack. In the recent Budget and the Parliament debate that followed, Finance Minister Tharman Shanmugaratnam made plain that the pace of the productivity push will be kept at a "steady clip" as Singapore restructures its economy. The Government will continue to give substantial help to small and medium-sized enterprises that will not be one size fits all, he said, adding that "traditional businesses do have a role to play in the future of the Singapore economy". Nominated MP Teo Siong Seng told The Straits Times that he wants a pan-ministry agency created that could help coordinate matters relating to small firms. He also said that while some of these traditional businesses may not be considered "high productivity" enterprises, they are a part of the cultural fabric of Singapore and should be valued as an important part of our heritage. Another traditional business is book rental shop Beauty World Book Centre. Mr Chan Kum Pohl, 65, has been running his shop with wife Teresa Yeo, 60, at Beauty World Centre in Upper Bukit Timah since 1983. They cannot afford to employ workers as business has not been doing well lately, due mainly to increased competition from libraries and e-books. "Around 10 years ago, we would have more than 10 customers come into our shop every day. Now, some days, we would see only two or three people stop by." A big concern is the ever-increasing rent, which accounts for 25 per cent of his operating costs. Mr Chan hopes the Government will step in and mitigate the rising price of retail space for small businesses. 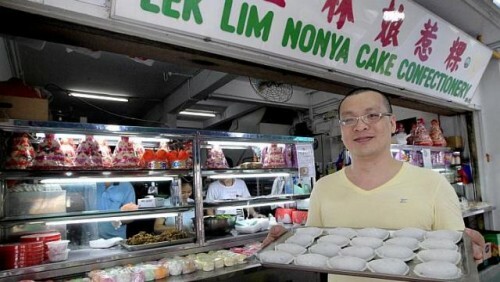 Hawker Gavan Sing, 34, who runs Lek Lim Nonya Cake Confectionery in Bedok North, tapped the Productivity and Innovation Credit scheme to buy a machine to cut ingredients such as turnips for making kueh. But there are limits to automation, he said, as the major selling point of his kueh is that it is handmade, requiring labour with a specialised skill set. With 18 full-time staff at the shop compared with seven 35 years ago, Mr Sing said business costs have indeed increased. Revenue has also stagnated in the past few years because of rising prices. However, CIMB economist Song Seng Wun notes that small traditional businesses must remain viable on their own. "We cannot subsidise everybody. The Government will only help those that can help themselves."